Mario. Link. Donkey Kong. These are the faces of Nintendo. But those aren't the only Nintendo icons. There's also this guy. This guy is Satoru Iwata. He is the President of Nintendo Co., Ltd. Chances are, however, if you like Nintendo games and Nintendo game news, Iwata is more than just a corporate suit. Way more. Since 2011, Nintendo has been using online press conferences called "Nintendo Direct" to get the word out about new games, as well as drip feed you (and us) some PR. Iwata appears in all the Nintendo Directs, making him an even more familiar face for those interested in video game news. Iwata's constant appearance in the Nintendo Directs is a brilliant move. Increasingly, Iwata is more and more inseparable from Nintendo. He is now another face of the gaming giant, up there with your favorite Nintendo characters and the company's in-house genius, Shigeru Miyamoto. But it's not just Iwata's constant appearance alone that's interesting. Like Steve Jobs and his black sweaters, Iwata is building up a set of iconography: the banker suits, the floppy hair, and the gesture. Whenever Iwata says "direct" or its Japanese equivalent "chokusetsu" (直接), he gestures both hands towards the camera. 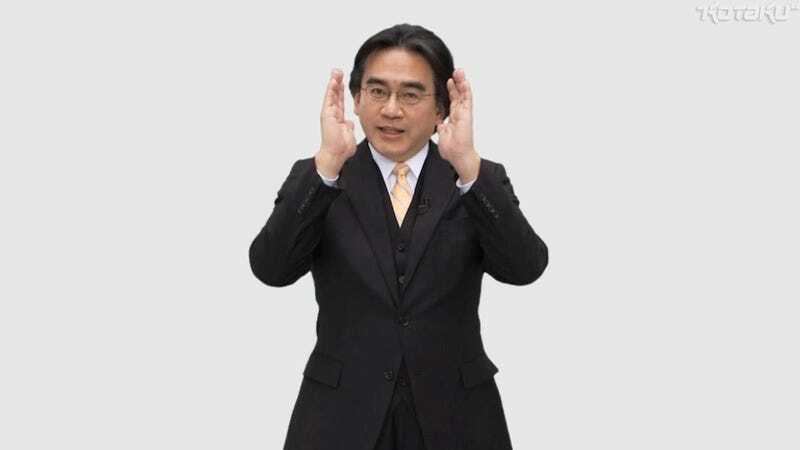 Iwata does this gesture in all the Nintendo Directs, making it his own catchphrase, as if he were a character himself. The Nintendo brass also has a regular series of "Iwata Asks" columns on Nintendo's homepage in which he interviews game developers. The interviews are controlled PR in the sense that you have a Nintendo employee often asking other Nintendo employees questions, which makes the interviews feed relatively safe. That being said, the interviews are often interesting, and Iwata occasionally even breaks news. Both the Nintendo Directs and the Iwata Asks help entrench Iwata in Nintendo. The company is old and traditional. Iwata is only the fourth president, and the first one not to be related to company's founding family and not to be from Kyoto. Yes, Iwata worked at Nintendo, developing games, but he is still an outsider. Nintendo isn't just a very Japanese company. It's a very Kyoto company. That's why before he helped turn Nintendo around, the Hokkaido-born Iwata was in a far more precarious position. But even recently, things have been better. Doing things like the Nintendo Direct, Iwata Asks, or even appearing in Nintendo games, Iwata continues to try to make himself as inseparable from Nintendo as Mario or Miyamoto. Creating this cult of personality around himself might be fun for Iwata, but it should also make him more secure in his spot at one of the biggest companies in gaming. Talk about being direct.